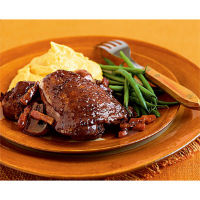 Pieces of chicken cooked slowly in a rich red wine sauce, enhanced by the robust flavours of shallots, garlic, mushrooms and bacon. Pour the wine into a medium pan and boil for about 5 minutes, or until reduced by a third. Heat the oil in a large, heavy-based saucepan with a lid. Add the chicken and fry for 8-10 minutes, until the skin is well browned, turning frequently (you may need to do this in batches). Remove with a slotted spoon, drain on kitchen paper and set aside. Add the bacon lardons and shallots to the pan and fry for 4-5 minutes, or until lightly browned, then stir in the flour and continue cooking for a further minute. Return the chicken to the pan with the garlic, thyme, bay leaves, reduced wine and stock. Bring to the boil, cover and simmer gently for 45 minutes to 1 hour, or until the chicken is thoroughly cooked and the juices run clear when pierced with a sharp knife. Add the mushrooms and cook for a further 10 minutes. Season. Serve with boiled carrots, steamed green beans and some potatoes which have been mashed together with a knob of butter and a splash of milk. Make the dish up to 24 hours in advance. Once cool, chill in the fridge until ready to reheat. If freezing, do so the day you make the dish, but do not add the mushrooms. Before serving, defrost in the fridge for 24 hours, then place on the hob on a low heat, bring to a simmer and continue from step 5. Montana Marlborough Classic Pinot Noir, Marlborough, New Zealand, is a delightfully fresh fruit-driven Pinot Noir, with an elegant balance, similar to that found in a good red burgundy. This recipe was first published in October 2004.